It’s not just school. It’s IB. The International Baccalaureate – or IB – is synonymous with academic excellence for millions of parents and students around the world. This program is known for developing in young people the intellectual, personal, emotional, and social skills needed to live, learn, and work in a rapidly globalizing environment. 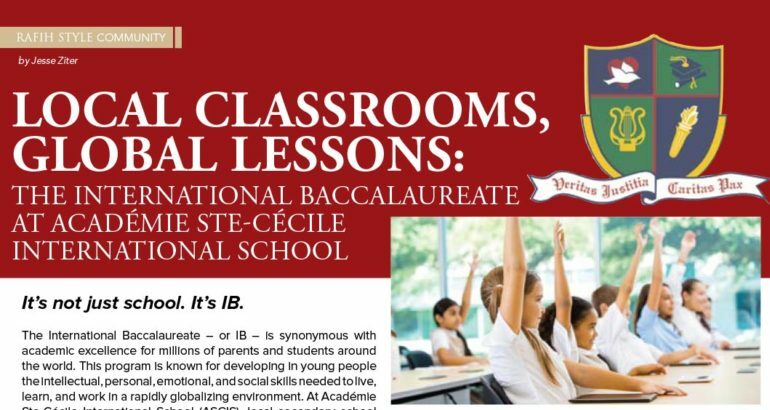 At Académie Ste-Cécile International School (ASCIS), local secondary school students have for several years used rigorous IB coursework to propel themselves to greater and greater heights. This year, for the first time, the school is taking a paradigm-shifting step to fully integrate the IB academic philosophy for middle school-aged students. It’s important to understand why this is such an important change. The IB is a Swiss-headquartered international educational foundation. According to its mission statement, the decades-old, globally minded organization supports schools as they develop inquisitive, knowledgeable, and compassionate young citizens with the ultimate goal of creating a peaceful, equitable, and culturally harmonious world. Lofty goals, to be sure, but very serious ones. To this end, the IB works with partner schools, governments, and international organizations to develop rigorous assessment models and challenging projects for students. At the centre of this polyvalent process is the IB Learner Profile, a set of ten complex attributes that underpins all of the organization’s educational efforts. It concisely describes the IB’s core values and reflects its educational philosophy by pointing to concrete learning outcomes. Successful IB Learners are thoughtful and knowledgeable inquirers who approach their schoolwork with a balanced and reflective perspective. On a day-to-day basis, they nurture their curiosity as they develop skills for inquiry and research. They learn with enthusiasm both independently and alongside others. IB Learners are empathetic, compassionate, ethical, and globally minded. They consider unfamiliar perspectives and exercise a strong understanding of justice and fairness in their judgements. They engage with issues and ideas that have both local and global significance. IB Learners can communicate confidently and creatively through multilingual expressions and multiple styles of meaning-making. IB Learners exercise critical and creative thinking skills to approach complex, multifaceted problems and make reasoned, ethical decisions. They take calculated, educated risks by approaching uncertainty with forethought and determination. Cognizant of their own strengths and weaknesses, IB Learners take responsibility for the consequences of their actions and commit themselves to ongoing personal development. Finally, IB Learners live carefully balanced lives that include intellectual, physical, and emotional riches. They recognize their interdependence with other people, and so they appreciate myriad cultures, traditions, and personal histories – including their own. Academic excellence is at the core of Académie Ste-Cécile. ASCIS students in Junior Kindergarten through Grade 8 study a custom-designed internal curriculum that meets or exceeds the Ontario Ministry of Education standards. To best serve students in between Grades 6 and 11, ASCIS is currently in candidacy for the IB Middle Years Programme (MYP), a world-class course of study used in several of the world’s best schools. IB students are assigned both school-specific and standardized assessments, which are then evaluated and graded by their classroom teachers and a team of external examiners from around the world. Internal assessments are moderated for accuracy and consistency by certified IB Examiners teaching at other partner schools. Courses conclude with an externally assessed series of examinations, generally comprising two or three timed written tests. At the end of the year, IB students know where they stand next to peers from top schools around the world. At ASCIS, the MYP will begin in Grade 7 and conclude in Grade 10. The school is targeting August 2018 as a realistic launch date, at which time Grades 7 and 8 will begin to follow the MYP curriculum. That curriculum is built around six “global contexts” and eight key subject areas: Language and Literature, Language Acquisition, Individuals and Societies, Sciences, Mathematics, Arts, Physical and Health Education, and Design. Typically, students work towards a long-term culminating project at the end of the program. While individual partner schools like ASCIS are entrusted to interpret the structured curriculum to a comfortable extent, each subject area must receive a minimum amount of curriculum hours each year. In order for a school to offer the MYP, it must receive explicit authorization from the IB and satisfy 74 discrete criteria. Perhaps most importantly, the school’s teachers must be willing and able to commit to a demanding course of training. Experienced educator David Brian is ASCIS’s IB MYP Coordinator. An Essex County native, Brian recently joined the ASCIS family after close to three decades teaching abroad. Most notably, Brian spent 22 years teaching at an IB partner school in Hong Kong. “We’ve started proceeding through our two-year journey toward authorization,” he confirms. The formal training process will involve virtual, in-school, and offsite seminars conducted by experienced workshop leaders from the IB Organization. This November, ASCIS’s first schoolwide MYP training session will see all staff members who interact with MYP-aged students trained in the MYP philosophy. While teacher training is a given, support staffers from kitchen workers to maintenance personnel will also participate in the campus-wide initiative. Outside of the classroom, the MYP also involves notable year-round requirements for community outreach that extend beyond the standards for volunteerism demanded of public school students. The DP is a two-year course of study for upper-year high school students that’s taught in schools in 140 countries. In Ontario, students who complete the DP graduate secondary school with two separate certificates: the IB Diploma and the OSSD. At ASCIS, the IB DP is an elective program for Grade 11 and 12 students. Significantly, ASCIS IB students are never sequestered away from the general population. All DP students share courses with mainstream OSSD students but also do additional hours of IB-related work in six critical subject areas. Additionally, IB students are required to complete three Core modules: The Theory of Knowledge (TOK), the Extended Essay (EE), and the Creativity, Activity, Service (CAS) module. The TOK, a compulsory subject, is an introductory philosophy course that exposes students to several major epistemological concepts most scholars don’t encounter until university. A serious area of study, it requires 100 hours of real instruction. The EE is a largely self-guided major research project that culminates with a 4,000-word paper. The assignment is an excellent way to prepare students for essay-based university courses. The CAS provides students with intellectual, physical, and creative opportunities for personal growth and self-reflection. Students participate in social or community work, athletics or other physical activities, and creative projects. For students who choose not to take on the rigorous requirements of the DP, the Career-related Programme (CP) is an intriguing option. A less arduous, more tightly focused way to engage with IB learning, it requires students to complete two or more courses from the DP curriculum, special vocational instruction, and the CP Core, a purpose-designed personal and professional skills course that can include experiential education, a reflective project, and language development training. Outside of its IB options, ASCIS also offers the Advanced Placement (AP) Courses, which are designed to bridge secondary and postsecondary studies by offering high-achieving high school students an elective opportunity to academically and intellectually extend themselves. Some AP courses qualify graduates for more advanced university courses than they would otherwise be able to access straight out of high school. In certain cases, students will be granted introductory level credits by their university for achieving at a high level in their AP courses. The Program is administered by the College Board, a nonprofit organization founded in the late 1800s with a membership association of more than 6,000 secondary schools, postsecondary institutions, and other educational organizations. The AP Program plays a significant role in the American college admissions process insofar as it provides high school students with a conspicuous platform for demonstrating their intellectual capacity and enthusiasm for challenging academic work. Ultimately, that puzzle is only one step in a much larger project; the next step is the best possible postsecondary education. One great benefit of IB is that it helps students bridge the gap between secondary school and university, removing the sudden shock that affects many students as they come to grips with a postsecondary workload. “The preparation and the transferable skills are the number-one selling points for me,” agrees Cooper. “All that extra work is what makes it the rigorous, prestigious program that it is. If you can do all that in your high school years, it tells university officials that you’re a hardworking student who can time manage and really challenged yourself. For further information about the IB, MYP, DP and AP programs at Académie Ste-Cécile International School, consult www.stececile.ca, phone (519) 969-1291, or email info@stcecile.ca today.